Mark Takai (born July 1, 1967, died 2016) was an American politician from the state of Hawaii. He the congressman of the U.S. House of Representatives, representing the 1st district, as a Democrat. He previously served in the Hawaii state legislature, from 1994 until 2014. Takai is from Aiea, Hawaii. He serves in the Hawaii Army National Guard as a Lieutenant Colonel and took part in Operation Iraqi Freedom in 2009. Takai became the Democratic nominee for the United States House of Representatives for Hawaii's 1st congressional district in the 2014 2014 elections, following incumbent Colleen Hanabusa's decision to run for the United States Senate. He won that election with 51.9% of the vote, defeating Republican former Congressman Charles Djou. B.A., 1990; Master Public Health, 1993. Tammy Duckworth and Mark Takai served together in the University of Hawaii Student Senate. Takai was the President of the Student Senate, the Associated Students of the University of Hawaii, and the Editor-in-Chief of the campus newspaper. 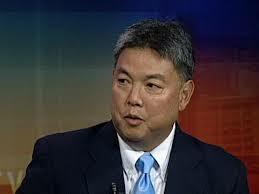 Takai was involved in exposing Professors who sexually harassed students. In a campaign ad for Takai in 2014 Duckworth said that she and Takai would fight sexual assault in the military. She also stated that Takai wants "equal pay for equal work". In 2014, the largest progressive group of veterans in America, VoteVets.org, on behalf of its more than 400,000 supporters, congratulated Mark Takai for his primary election victory, as he seeks to represent Hawaii’s First District in Congress. The group had recently spent $175,000 in television advertising touting Takai’s biography and record. “From Kuwait to the State House, Mark has always been there for those who served in uniform,” said Greg White, Hawaii State Chair for VoteVets.org. “But, his record is so much more than that. His dedication to Hawaii, and his constituents, has been boundless. From seniors to children, and all of the working men and women in between, Mark has been there. He’ll carry that dedication to Congress, and make us all very proud.” The largest progressive group of veterans in America,VoteVets.org, on behalf of its more than 400,000 supporters, congratulated Mark Takai for his primary election victory, as he seeks to represent Hawaii’s First District in Congress. The group had recently spent $175,000 in television advertising touting Takai’s biography and record. In 2014, Mark Takai (HI House District 33 (Aiea)) is a current and former Asian American Action Fund endorsed candidate now running for election to represent HI-1 (Honolulu, Kaimuki, Aiea, Mililani, Pearl City, Waipahu, Waimalu). He is already the Democratic Nominee for Hawaii’s 1st Congressional district. In January 2015, Mark Takai was listed as a new member of the Congressional Progressive Caucus. The proposed Trans-Pacific Partnership trade deal "could only lead to the offshoring of U.S. jobs, especially in the service sector, and the erosion of America wages, nine newly-elected Democrats said in a letter to the president. Overall, 13 of 17 newly-elected Democrats are opposing Fast Track". Rep. Ruben Gallego (D-AZ) led the efforts of a group of the letter writers and his version was signed by Brendan Boyle of Pennsylvania's 13th District; Mark DeSaulnier of California's 11th District; Debbie Dingell of Michigan's 12th District; Brenda Lawrence of Michigan's 14th District; Ted Lieu of California's 33rd District; Kathleen Rice of New York's 4th District; Mark Takai of Hawaii's 1st District; and Bonnie Watson Coleman of New Jersey's 12th District. "[W]e believe this legislation lacked sufficient guarantees to ensure Congress' voice in shaping the substance of international trade agreements negotiated by the Administration," another group of freshman Democratic legislators wrote. "Our concern is that previous versions of TPA legislation did not ensure sufficient input of our constituents' concerns about labor, environmental, and human rights protections that must be essential in the trade deals you are currently negotiating." Reps. Seth Moulton of Massachusetts' 6th District, Pete Aguilar of California's 31st District and Norma Torres of California's 35th District a the second letter. Asian Pacific American Heritage Month festivities continue! Thank you to my colleagues at the Democratic Asian Americans of Virginia for organizing a phenomenal event tonight. It was a packed house! Many thanks to Congressmen Mike Honda, Mark Takai, and Congressman Bobby Scott for joining us. Thank you also to friends from the Arlington County Democratic Committee, Fairfax County Democratic Commitee... See More — with James T. Tsai, Mark Takai, Hung Nguyen, Dewita Soeharjono and Linh Hoangmeister at Minh's Vietnamese Restaurant. This page was last modified on 28 January 2019, at 21:54.